”Sri Lanka is reinvigorating its representation in the United States as the bilateral relations and people to people ties between the two nations are on an exponential growth trajectory” Sri Lanka’s Ambassador to the United States Prasad Kariyawasam said speaking at an event organized by the World Affairs Council in Dallas-Fort Worth to welcome Susantha Shan Halamba as the new Honorary Consul for Sri Lanka to the state of Texas. 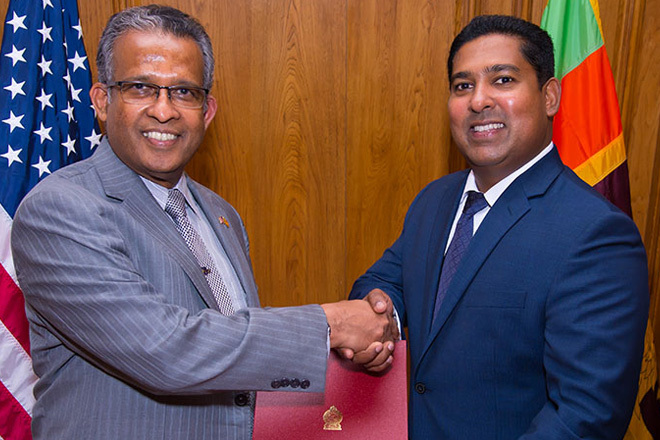 The government of Sri Lanka has decided to expand its presence in Texas in line with the unprecedented expansion in bilateral relations with United States. Texas is the second largest American state and is home to a substantial Sri Lankan-American community and important businesses with ties to Sri Lanka. The new appointment would help serve the state’s Sri Lankan community while facilitating multiple spheres of cooperation with state of Texas. The Ambassador ceremonially handed over the Commission of Appointment to Halamba at the event in the presence of a cross section of community and business leaders of Dallas-Fort Worth, including Sri Lankan-Americans in Texas. Welcoming the invitees to the event, the Council’s President and CEO Jim Falk recalled the age-old relations between the two countries spanning over two centuries. Monica Alonzo, Mayor Pro Tem of Dallas, Sara Wilshaw, Consul General of Canada and the Dean of the Consular Corps of Dallas-Fort Worth, and Gal Jumaoas, President of the Greater Dallas Asian American Chamber of Commerce, also spoke welcoming the new Honorary Consul and expressing their desire to work with him to foster greater relations between Texas and Sri Lanka in all spheres of mutual interest. In his remarks, Shan Halamba thanked the Sri Lankan Government for giving him the privilege of contributing to the promotion of greater cooperation and friendship between Sri Lanka and the United States. The new Honorary Consul Shan Halamba is the Co-Founder, President and Chief Executive Officer of Ceyhinz Link International Inc. headquartered in Irving, Texas – the parent company of RIOCOCO Worldwide and Ceytips Ceylon Tea – and also the Co-Founder, President of the Texas-based Unitech Solutions Inc. Halamba is the recipient of the Gold Stevie Award for Executive of the Year, Management Award under the category of All Other Industries in 2015. Previously, he was awarded the International Businessman of The Year award by the Greater Dallas Asian American Chamber of Commerce and Texas Governor’s Business Champion Award.